Check out our fantastic range of tasty, wholesale Swizzels confectionery, there's a sweet treat to suit all taste buds, young and old. 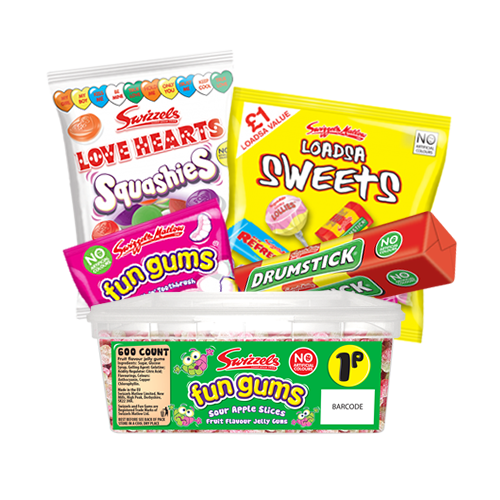 From drumsticks to love hearts, Swizzels are well known for manufacturing some of the nation's most loved sweet treats, all of which are available here at Harrisons Direct. Here at Harrisons Direct we have a fantastic range of tasty, wholesale Swizzels confectionery at fantastic prices, waiting for you to purchase! Swizzels are famous for their variety of tasty sweets and it all started from a small factory in London in 1928. Since they invented the famous Rainbow Drops in the 1930’s the confectionery giants have gone from strength to strength and are one of the market leaders in confectionery. We only sell the best wholesale confectionery here at Harrisons Direct and that’s why we sell Swizzels. Our range of wholesale Swizzels is of the highest quality and will leave your customers wanting more. Varying in price we have something to offer all buyers, no matter what your wholesale confectionery requirements. Our large range of wholesale Swizzels confectionery includes the famous Drumstick Lollies, the Refreshers Original Chew Bar, Giant Parma Violets, Double Dip, Giant Love Hearts, a variety of pre-packed bags and much more, all at competitive prices. And if you are a new customer we will offer you 10% off your first order, so what are you waiting for? Our wholesale confectionery operation services a number of major clients such as Butlins, Haven and Roadchef and our system allows us to provide all customers with the same fantastic standards regardless of how big or small their company is. If you don’t believe us then why not check out our testimonials page, which includes feedback from a number of our satisfied customers, and see how we are capable of providing wholesale Swizzels Matlow and wholesale confectionery services to the entire UK market. Here at Harrisons, we offer fantastic delivery services. When you place an order worth more than £150 we offer free next day delivery for added value. If time is of the essence, the website also offers a ‘Click and Collect’ service for those who wish to come and visit us in Accrington. We look forward to seeing you! If you have any questions regarding our range of wholesale Swizzels Matlow give us a call on 01254 306840 and our friendly team will be happy to help!